RecipharmCobra Biologics, Keele (previously Cobra Biomanufacturing Plc) has been producing plasmid DNA for clinical trials for more than 10 years and has an approved site under the EU clinical trials directive. During this period, the company has produced more than 40 plasmids (ranging from 500 mg to 5 g) for 25 customers in Europe and the United States. These plasmids have been used for gene therapy and vaccines as well as to produce viral vectors. RecipharmCobra has developed its own manufacturing process and related technologies including an antibiotic-free plasmid maintenance system (ORT: operator repressor titration) and cell lysis technologies (1). We assessed PlasmidSelect Xtra chromatography resin from GE Healthcare as part of an internal development program, the aim of which was to improve process robustness and resolution of key contaminants from the plasmid product. Although this work was part of a long-term development program, there was also an immediate requirement to address purity issues with on-going manufacturing projects in which the removal of some contaminants had proved problematic. Initial studies focused on introducing the GE resin as an additional polishing step to our existing platform process. Following the success of this work, studies were performed to identify whether it was possible to streamline the platform process to a two-step purification process that includes the PlasmidSelect Xtra resin. PlasmidSelect Xtra resin is based on thiophilic aromatic chromatography, which can separate plasmid from host contaminants (e.g., chromosomal DNA and endotoxin) and provides good resolution between open- and closed-circle forms of plasmid DNA (2,3). Separation was achieved using isocratic (as well as gradient) elution from the column, which is more easily scaled and may have better resolution and processing yields. The resin had reported binding capacities in the region of 2mg/mL, which is relatively high for a large macromolecule. Plasmid DNA is used in clinical trials two ways: as a therapeutic agent (either as a therapy or for the generation of vaccine antigens) and as a transfection agent to produce viral constructs such as lentivirus or adenoassociated virus (AAV), for which multiple plasmid constructs are required to produce an individual viral product in transient production systems. Plasmids used for therapeutic agents tend to be relatively small — usually 4.5–6 kb — but can be as small as 2.5 kb. Those used for viral constructs are larger (≥11 kb). Although the production of plasmids as therapeutic agents has always been performed to current good manufacturing practices (CGMPs), the regulations relating to their production for viral constructs has been under some debate. Within the Eurpean Union, however, the increasing trend seems to be that such plasmids should be produced under CGMPs from master cell banks and to the same standards and product-release specifications as are conventional plasmid products for therapeutic applications. Production of plasmid DNA for clinical use creates purification challenges related to removal of bacterial host-cell contaminants, including chromosomal DNA, RNA, and endotoxins and the segregation of supercoiled and open-circle forms of the plasmid. Those contaminants have similar properties to the target molecule, so strategies must be developed for their removal. The FDA set recommendations for acceptable levels of contaminants for plasmid DNA at <1% w/w chromosomal DNA, RNA, and proteins, 80% supercoiled pDNA (4). Those values are mainly guidelines; normal industry expectations for supercoiled plasmid levels is usually >90% and often as high as 95%. Plasmid DNA is often regarded commercially as a commodity product, and many people assume that all plasmid contructs can be produced from a “platform process” with limited, if any process development. However, pDNA constructs are highly variable in plasmid size, plasmid backbone, and gene inserts, resulting in a wide range of cell culture productivity and highly variable levels of product and host-related contaminants that must be removed in the purification process. Therefore, a platform purification process applied to their production must be highly robust regarding key contaminant removal, and it should have an intrinsically low cost due to market expectations of product value. The initial building blocks for a pDNA production process of high–copy-number plasmid fermentations and recovery of plasmid by alkali cell lysis are well established (5). Precipitation of contaminants from a lysate is used and may elminate the need to use bovine RNAseA for host RNA removal (6). A lysate is usually processed through several chromatographic steps for further contaminant removal. However, a nonchromatographic manufacturing process using selective precipitation with the detergent cetyltrimethyl-ammoniumbromide (CTAB) combined with silica absorption and ultraf iltration has also been described (7,9). Chromatography separations are usually based on a combination of ion exchange (IEX), hydrophobic interaction (including ion-pair interaction), and size exclusion (SEC) chromatographies (9,10,11). These techniques can be manipulated to remove bulk contaminants such as RNA, host cell protein, and endotoxin. However, removal of host chromosomal DNA fragments and open-circle plasmids is more difficult to achieve because of their chemical similarities to the target supercoiled plasmid, and highly selective processes are required to achieve such separations at an industrial scale for a wide range of plasmid constructs. The source and nature of those contaminants are poorly understood and complex to analyze. Generation of small host chromosomal DNA fragments that do not precipitate during alkali lysis is thought to be influenced by a number of factors, ranging from cell states in the fermentation to enzymatic and mechanical degradation during cell recovery and lysis. Furthermore, the level of host DNA will vary significantly by host strain and plasmid construct. There is also a limited understanding of why higher levels of open-circle plasmid forms are generated within some production systems. Although it is possible to manipulate fermentation conditions to reduce open-circle plasmids, levels will vary between plasmids. Larger plasmids are significantly more prone to the generation of high levels of open-circle plasmid than small ones. Application of a platform approach to plasmid DNA production makes it infeasible to optimize individual operations to prevent the formation of these contaminants for each product produced. Consequently, the process requires high-resolution, robust steps that can consistently remove such contaminants from a wide range of feed streams. using RecipharmCobra’s existing three-step chromatography process, based on anion-exchange (AEX) capture followed by ion-pair interaction and SEC polishing steps. The three failed to meet specification with regards to levels of supercoiled plasmid and two had also failed because of excessively high levels of host DNA. We tested PlasmidSelect Xtra polishing of all three plasmids at a 3-mg scale (3 mg plasmid in load) and retested for two of the plasmids at a 70-mg scale before all three bulk plasmids were processed at 1,000-mg scale under CGMP conditions. In all cases, we thawed the out-of- specification plasmids (in Tris-EDTA buffer, pH 7.5) at 2–8 °C and adjusted to the PlasmidSelect Xtra binding conditions (2.1 M (NH4)2SO4) by adding 3.0M (NH4)2SO4, 100 mM Tris, 10 mM EDTA, pH 7.5 before loading onto PlasmidSelect Xtra columns previously equilibrated with 2.0 M (NH4)2SO4, 100 mM Tris, and 10 mM EDTA (pH 7.5) at 1.0 mg plasmid/mL resin at 60 cm/h. We washed the columns with equilibration buffer (open-circle plasmid is not retained and is removed at this point) before eluting the supercoiled plasmid with 1.7 M (NH4)2SO4, 0.3 M NaCl, 100mM Tris, and 10 mM EDTA (pH 7.5). Finally, we washed the columns with 100 mM Tris and 10 mM EDTA (pH 7.5) to remove plasmid still bound to the resin. Figure 1 shows the chromatogram from the polishing of an 8.8-kb plasmid by PlasmidSelect Xtra resin at a 70-mg (load) scale. Figure 2 shows agarose gel electrophoresis (AGE) analysis of the polishing step. The plasmids were formulated into 10 mM Tris and 1 mM EDTA (pH 7.5) and analyzed by capillary gel electrophoresis and quantitative PCR. Table 1 shows the levels of supercoiled plasmid and host DNA before and after the polishing step for the 3-mg (PD1), 70-mg (PD2), and 1000-mg (GMP) scale processes. At all scales, where assessed, the supercoiled plasmid levels were brought into specification (>90%), as was the host DNA levels for the two plasmids previously above the required level (<5% w/w). Data showed that the PlasmidSelect Xtra chromatographic step was robust regarding the resolution of open and supercoiled plasmid species and could achieve very significant reductions in the level of host DNA. The simple isocratic elution procedure was also readily scalable from development to manufacturing. Streamlining Existing Plasmid DNA Purification Platform with PlasmidSelect Xtra Resin: The next stage of development was to assess whether the GE resin could be integrated into RecipharmCobra’s existing DNA production process. Specifically, the objective was to replace one or more current chromatography steps while delivering plasmid DNA within required specifications. Using a 5.7-kb plasmid that was successfully purified with the existing purification platform, we captured plasmid DNA from alkali-lysed cells using AEX chromatography and proprietary methods. We adjusted AEX eluate to 2.1 M (NH4)2SO4, loaded 60 mg plasmid onto a PlasmidSelect Xtra column at 1.0 mg pDNA/mL resin at a flow rate of 60 cm/h, washed to remove open- circle plasmids, and eluted the supercoiled plasmid as before. The supercoiled plasmid was split into two equal amounts and either formulated into Tris/EDTA buffer or subjected to SEC using proprietary methods before formulation. We optimized the PlasmidSelect Xtra step for binding capacity and operating flow rate. Figure 3 shows AGE analysis of the purification of the 5.7 kb plasmid when the binding capacity was increased to 2.0 mg plasmid/mL resin and the binding/wash flow rate increased to 120 cm/h. To prevent pressure buildup during desorption of the column due to the high viscosity of the concentrated plasmid DNA solution, the flow rate was decreased to 100 cm/h for the elution step. Figure 4 shows a chromatogram of the PlasmidSelect Xtra step at these optimized conditions. As shown in Figure 3, open-circle plasmid is observed in the unadsorbed (flowthrough) fraction. When the column is washed, more open-circle plasmid is removed along with a larger DNA fragment and a small amount of supercoiled plasmid. The presence of open-circle plasmid in the unabsorbed fraction is likely a result of the presence of NaCl in the post-AEX material, which will affect plasmid interactions with the resin. No supercoiled plasmid is observed in the unadsorbed fraction; therefore the presence of open-circle plasmid is of low concern. Process optimization by increasing the concentration of ammonium sulfate in the load may help all plasmid isoforms bind to the resin. The amount of supercoiled plasmid lost in the open-circle peak is proportionally very low and again may be addressed by process optimization if required. At manufacturing scale, this abbreviated process has significant advantages over the original three-column process, including reduced time, labor, and consumable and buffer requirements (Figure 5). Based on standard working hours, the new process saves two processing days per batch, and removal of buffer exchange and SEC steps significantly reduces buffer volume and removes the need for the large volume of SEC resin, which reduces cost. Assessment of PlasmidSelect Xtra Resin with Multiple Plasmid Types: The next stage in development program was to assess the optimized two-column purification process with other plasmid constructs to demonstrate its robustness. We assessed two plasmids: one that had proven to be highly challenging and one that was more representative of “standard” therapeutic vectors. We purified both plasmids from frozen cell paste (stored at −80 °C) recovered from 5-L stirred tank reactor fermentations. We captured plasmid from alkali-lysed cells using AEX chromatography and proprietary methods. The AEX eluate was held overnight at 2–8 °C, adjusted to 2.1 M (NH4)2SO4, then loaded onto a PlasmidSelect Xtra column at 2.0 mg pDNA/mL resin at 120 cm/h. We washed the column as before and eluted supercoiled plasmid with 1.7 M (NH4)2SO4, 0.3 M NaCl, 100 mM Tris, 10 mM EDTA (pH 7.5) at a f low rate of 100 cm/h. The solution was held overnight and formulated into Tris/EDTA buffer (pH 7.5) using ultrafiltration. Plasmid A 2.5-kb Therapeutic Vector: This unusually small plasmid construct was based on a minimized plasmid backbone and small gene insert. Initial processing indicated that the structure gave very low yields of plasmid per gram of cell mass, although plasmid copy number was acceptably high. Because of the low plasmid yield, high levels of host DNA were carried through from the alkali lysis step and insufficiently reduced by the original process of AEX, ion-pair, and SEC chromatographies. Levels up to 15% w/w host DNA had been observed for this plasmid product. Using the AEX/PlasmidSelect Xtra process, we purified Plasmid A from 5-L fermentations three times to generate a databank before progressing to CGMP manufacture. Plasmid B 6.2-kb Therapeutic Vector: This is representative of conventional gene therapy vectors in human clinical trials. We performed one purification run at 5-L fermentation scale. The chromatograms of the PlasmidSelect Xtra step for plasmids A and B (Figure 6) show very similar profiles to each other and to that of the 5.7 kb plasmid in Figure 4. In these examples, open-circle plasmids do not bind tightly to the column and are observed in the unadsorbed (flowthrough) fraction, indicating that the presence of NaCl in the AEX eluate (rather than plasmid size) is the likely cause. For each development run, we processed ~130–200 mg of plasmid, depending on the productivity of the fermentations. Using PlasmidSelect Xtra columns of 50–75mL (loaded at 2.0 mg/mL), recovery of total plasmid DNA across the PlasmidSelect Xtra step was 80–90% (determined by UV absorbance). Overall process yields were 65–76%. 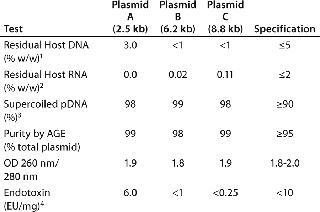 Table 3 shows the analytical results from the 5-L development-scale purification runs of plasmids A and B. Table 3: Analytical results of purification of two plasmids by a two-step chromatographic process at a 5-L development scale. 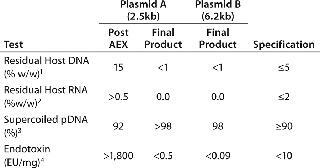 The post-AEX results from one run and typical formulated final product results from three purifications are shown for Plasmid A (2.5 kb). Final-product results are shown from a single purification of Plasmid B (6.2 kb), along with typical specifications for a CGMP-manufactured product of this kind. Levels of 98–99% supercoiled plasmid DNA seen in the final products also gave us confidence that the specification of >90% would be achieved at larger scale manufacture. The overall process yields were also higher than observed with the original three-column process. CGMP Production: Following development studies, we scaled plasmids A and B from the 5-L fermentation protocols to a 50-L fermentation manufacturing process. We performed these processes to detailed batch records under CGMP using the chromatographic conditions, flow rates, and plasmid loadings developed at the 5-L scale. The plasmids were formulated into required formulation buffers before analysis and release of bulk drug products using qualified analytical procedures. At the same time, we scaled another plasmid that had not been previously assessed at the 5-L scale to a 50-L fermentation scale CGMP manufacture (plasmid C, 8.8 kb transfection vector). This is a relatively large plasmid for use in viral production. During fermentation development, we observed high levels of open-circle plasmids (15–20%). The cause of this is not fully understood and could only be marginally improved by modifying the fermentation processes. Previous CGMP manufacture using RecipharmCobra’s original process resulted in an “out-of-specification” drug product, and this plasmid was one of the three further processed using PlasmidSelect Xtra resin, as detailed previously. To meet the required amounts of purified plasmid, we processed ~1,300 mg of plasmids A and C and 5,600 mg of Plasmid B using PlasmidSelect Xtra at 2.0 mg/mL loading. Step yields for plasmids A and C were 78–87% and 93% for Plasmid B (determined with UV absorbance). Table 4 shows analytical results from the 50-L scale CGMP manufacture of plasmids A, B, and C. All three plasmids met required outline specifications, although the residual host DNA levels for plasmid A were above FDA recommendations of <1% w/w (3%), indicating the challenge set by this low-yield plasmid. Table 4: Analytical results of the purification of three plasmids by a two-step chromatographic process at a 50-L CGMP scale. PlasmidSelect Xtra chromatography resin for purification of pharmaceutical-grade plasmid DNA was assessed in two process configurations. First, it was assessed as a polishing step for partially purified plasmids at a small scale, where high levels of purity were achieved with three challenging plasmids. Upon scale-up to the 1-g level performed under CGMP, all three plasmids showed significant improvement in product purity and successfully met required client specifications. All assay results were within recommendations for plasmid DNA products by the FDA, apart from the residual host DNA level of one plasmid. The second approach was to assess the resin as a replacement for the two existing polishing steps in RecipharmCobra’s existing platform process, specifically the ion-pair and SEC chromatography steps. Those steps had limitations in the chromatographic resolving capacity regarding high levels of host DNA and open-circle plasmid forms. In addition, they have operational limitations with regard to binding capacity and scalability. So the replacement of these steps had been a long-term development goal. All analytical procedures are proprietary to Cobra Biomanufacturing. Where possible, analysis was performed using qualified procedures used for the clearance of clinical materials. Residual Host DNA: Residual host DNA levels were determined using quantitative PCR (QPCR) with primers targeting the FhuE1 gene and a FAM- MGB probe against a standard curve of Escherichia coli DNA. omparison to a reference standard. Purity By Free Solution Capillary Electrophoresis: Supercoiled plasmid levels were determined using silica capillary gel electrophoresis and absorbance detection at 260 nm, based on percent-area of integrated peaks. Endotoxin Determination: Endotoxin levels were determined with a bespoke kinetic chromogenic (KQCL) Limulus amebocyte lysate (LAL) assay against a standard curve. Purity By Agarose Gel Electrophoresis: Plasmid was resolved in a 1% agarose gel matrix under an electric field, stained with ethidium bromide and visualized under UV to determine relative amounts of plasmid isoforms. A260/A280 Ratio: The ratio of absorbance at 260:280 nm is determined as an estimation of plasmid purity with respect to contamination of RNA and protein. A ratio of 1.8 to 2.0 indicates “pure” DNA. We developed a PlasmidSelect Xtra step after initial plasmid capture using existing AEX chromatography methods and a 5.7kb model plasmid at small scale. After generating promising initial results, we optimized the process for load and running conditions and assessed two other plasmids with full analysis, which showed the formulated bulk products were within FDA recommendations. The abbreviated process was scaled-up to 50-L fermentations for the CGMP manufacture of three plasmids to supply clinical studies. All plasmid products met outlined specifications, although the FDA guidelines for host DNA levels could not be reached for one of the plasmids (plasmid A). However, when assessing the levels of product purity achieved using PlasmidSelect Xtra, it is important to compare levels of purity achieved with the previous existing approaches, especially for the problematic plasmid A. Previous attempts to purify this plasmid using either hydrophobic interaction chromatography (HIC, not reported here) or ion-pair approaches failed to reduce levels of host DNA to <5%. Therefore, the levels of host DNA, although not within the levels indicated in FDA guidelines, are still regarded as a significant success and allowed this product to be submitted for clinical studies. The less challenging plasmids B and C were purified to a very high standard, which met all guideline values. The three GMP manufacture processes achieved step yields of 78% or higher, as high as 93% for plasmid B. The yield for this step highly depends on the levels of open-circle plasmid in the initial feedstock, and the 78% total plasmid recovery for plasmid C indicates removal of a large proportion of open-circle plasmid by the step. These yields and purities were achieved without optimization for the specific plasmid constructs tested. It may be possible to improve on these with some degree of optimization for individual plasmids. However, from an initial development perspective, both yield and purity are very high and allow for product development and manufacture without timely and expensive optimization before clinical trial materials production. 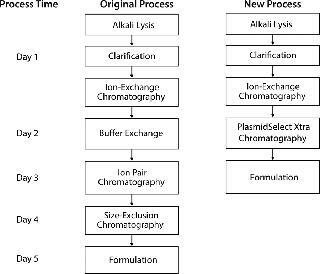 The approach taken of replacing a three-column process with a two-column process based on ion-exchange and PlasmidSelect Xtra chromatographies creates the opportunity to reduce plasmid purification process time and to reduce equipment, consumables, buffer requirements, and costs while improving purity and yield. The abbreviated process is simplifIed and more readily scalable to produce large quantities of plasmid for clinical uses. From a contract manufacturing perspective, this approach brings significant benefit. Customers have an expectation that product such as plasmid DNA should be produced with fixed prices and timelines. This is a highly challenging expectation given the complexity of the products and the regulatory environment surrounding their production. Any procedure that is sufficiently robust to reduce the need for extended development programs and reduce risk manufacturing failures is of considerable worth to a manufacturing organization. All methods, apart from those for the use of PlasmidSelect Xtra resin are proprietary to RecipharmCobra Biologics. Outlines are given below. Fermentation: Host strains were either DH1 or DH1-ORT strains of Escherichia coli. ORT (operator repression titration) is Cobra’s proprietary technology for antibiotic-free genes plasmid maintenance within the cells. In all cases, research cell banks were generated and plasmid segregational stability confirmed. Cell banks were used to inoculate shake flask cultures, which in turn were used to inoculate 5-L fermentation vessels. Those supply fermentations were performed using linear fed-batch feed strategies, harvested 15–18 h post inoculation and cell paste stored at −80 °C until required. Cell Lysis and Clarification: Cell paste was thawed and resuspended in Tris/EDTA buffer containing RNAseA, lysed by alkali lysis followed by neutralization and precipitation of cellular debris and host DNA with sodium acetate. The plasmid was then recovered following centrifugation and depth filtration to the remove precipitated material. Anion-Exchange Chromatography: Plasmid was captured from lysate by low-pressure anion-exchange chromatography, 0.2-μm filtered and either held at 2–8 °C overnight before further processing or frozen at −20 °C to provide material for development work. Plasmid Select Xtra Chromatography: PlasmidSelect Xtra chromatography was performed according to instructions from GE Healthcare. We adjust material resulting from the AEX separation to the binding conditions of 2.1 M (NH4)2SO4 by adding 100 mM Tris, 10 mM EDTA, and 3.0 M (NH4)2SO4 (pH 7.5). Then we filtered it before loading onto PlasmidSelect Xtra column previously equilibrated with 100 mM Tris, 10 mM EDTA, 2.0 M (NH4)2SO4 (pH7.5). 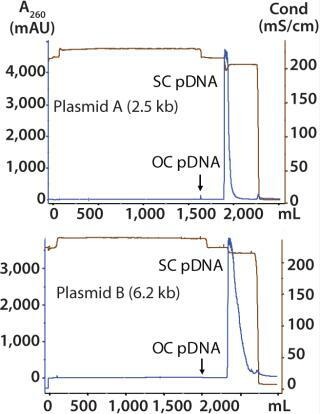 Open-circle plasmid was removed by washing the column with equilibration buffer and the supercoiled pDNA eluted with 100 mM Tris, 10 mM EDTA, 0.3 M NaCl, 1.7 M (NH4)2SO4 (pH7.5). The column is finally stripped with 100 mM Tris, 10 mM EDTA (pH 7.5) to remove any material still bound (e.g., denatured plasmid, chromosomal DNA). During development work the PlasmidSelect Xtra column was loaded at 1.0 mg plasmid/mL resin and run at 60 cm/h. The step was optimized to 2 mg/mL loading and run at 120 cm/h for the loading and wash steps and 100 cm/h for elution. The slower elution flow rate prevented pressure buildup during desorption of the column caused by the high viscosity of the concentrated plasmid DNA solution. Anion-Exchange Chromatography: Plasmid was captured from lysate by low-pressure AEX, 0.2-m filtered, and either held at 2–8 °C overnight before further processing or frozen at −20 °C to provide material for development work. SEC Chromatography was performed in formulation buffer (usually Tris/EDTA, Ph 7.5). Plasmid was loaded at ≥10% of the column volume at a flow rate of 25 cm/h. Buffer Exchange By Tangential Flow Filtration (TFF): Plasmid solution was concentrated and diafiltered against required formulation buffer (usually Tris/EDTA, pH 7.5) using a TFF system fitted with 30 kDa molecular weight cut-off regenerated cellulose membranes. Generally, plasmid was concentrated to 1.0–2.0 mg/mL before diafiltration, recovery, and 0.2-μm filtration. tist, Process Science; and H. A. Tharia is section head, Process Science, all at RecipharmCobra Biologics Keele, ST5 5SP, UK; tony.hitchcock@recipharm.com. H. Blom is a research engineer at GE healthcare Bio-Sciences AB, Björkgatan 30, SE-751 84 Uppsala, Sweden. 1.) Cranenburgh, R. 2001. Escherichia coli Strains That Allow Antibiotic-Free Plasmid Selection and Maintenance by Repressor Titration. Nucleic Acids Res. 29:E26. 2.) Sandberg, LM. 2004. Thiophilic Interaction Chromatography for Supercoiled Plasmid DNA Purification. J. Biotechnol. 109:193-194. 3.) Lemmens, R. 2003. Supercoiled Plasmid DNA: Selective Purification by Thiophilic/Aromatic Adsorption. J. Chromatogr. B Analyt. Technol. Biomed. Life Sci. 784:291-300. 4.) Center for Biologics Evaluation and Research 2007.Guidance for Industry: Considerations for Plasmid DNA Vaccines for Infectious Disease Modifications, US Food and Drug Administration. 5.) Birnboim, HC, J. Doly, and A. Rapid. 1979. 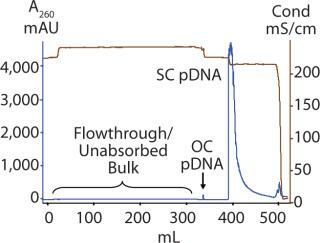 Alkaline Extraction Procedure for Screening Recombinant Plasmids. Nucleic Acids Res. 7:1513-1523. 6.) Wahlund, PO. 2004. Precipitation by Polycation as Capture Step in Purification of Plasmid DNA from a Clarified Lysate. Biotechnol. Bioeng 87:675-684. 7.) Lander, RJ. 2002. Fractional Precipitation of Plasmid DNA from Lysate by CTAB. Biotechnol. Bioeng. 79:776-784. 8.) Winters, MA. 2003. 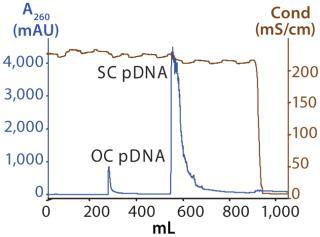 Plasmid DNA Purification by Selective Calcium Silicate Adsorption of Closely Related Impurities. Biotechnol. Prog. 19:440-447. 9.) Green, AP. 2007. Preparative Purification of Supercoiled Plasmid DNA for Therapeutic Applications. BioPharm 10:52-53. 10.) Horn, NN. 1995. 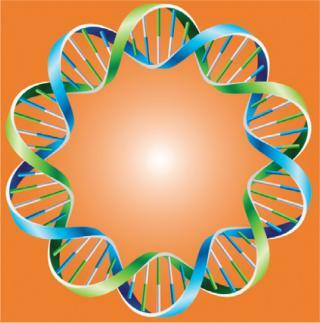 Cancer Gene Therapy Using Plasmid DNA: Purification of DNA for Human Clinical Trials. Human Gene Ther. 6:565-573. 11.) Ferreira, GNM. 2005. Chromatographic Approaches in the Purification of Plasmid DNA for Therapy and Vaccination. Chem. Eng. Technol. 28:1285-1294.